Residents of a rural village in Scotland have been left confused after Openreach (BT) deployed a new “fibre broadband” (FTTC / VDSL2) street cabinet into their area that appears to serve some properties, while leaving many of those who live closest to it unable to receive a faster connection. The village of Durno is an interesting one, not least because it is split between a collection of new and old properties, some of which were only built a few short years ago. One primary example of this is the small new build development called Parkside Gardens, which is owned by Ardinn Homes and features a small number of “deluxe” 4 or 5 bedroom houses. We should point out that this build was conducted by a small local developer without significant resources, which meant that planning and building has taken considerably longer. The original planning permission for the first 8 houses was granted as early as 2010/11 and the first house (show home) was completed in 2012. The development was finally completed in late 2015 and most people started moving in from 2014. Unfortunately much of the village has long suffered from slow broadband speeds, which during 2014 resulted in some negative publicity for Openreach and plans were then agreed to deploy a new ‘up to’ 80Mbps capable Fibre-to-the-Cabinet (FTTC) network into the area. The good news is that the new FTTC cabinet finally went live in the centre of the village during late December 2017 but problems soon emerged. “It has resulted in only some premises in my village gaining access to superfast broadband, not including myself, due to not enough capacity on the new fibre line. The situation is utterly ridiculous, and we have been given no timeframe for resolution of this ongoing problem. My wife works from home and finds the internet connection speed a challenge for some of the work she has to do which involves the use large size files (100s MB). Often she resorts to sending things via recorded delivery on USB or travelling to the office in Glasgow, all because of our woeful internet connection speed. Something simply has to be done to impel Openreach to improve their service provision as it is currently an utter shambles. As stated above, Ed was initially told by his ISP that the problems were related to a lack of capacity for new fibre lines in the area (full cabinet), although it soon became clear that some houses in the area were in fact still able to order and get the service installed. Similarly Openreach’s database reported a hodgepodge mix of results, which is at least partly because some homes are still connected to a different cabinet much further away in Pitcaple. 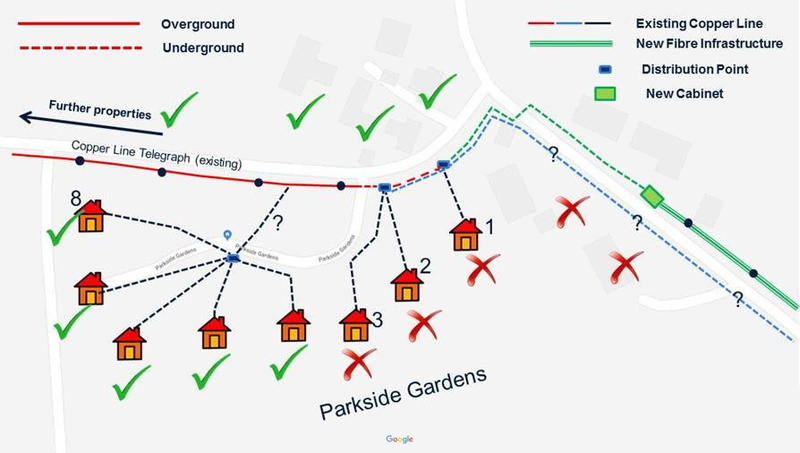 Ed has kindly drawn a rough map to help illustrate the wonky arrangement, which results in a bizarre situation where some homes that reside closest to the new cabinet cannot benefit from FTTC (normally these could expect the fastest speeds). As if to add insult to injury, some of the residents who now find themselves rejected were until very recently being told, both by their ISP and engineers on the ground, that the new service would indeed reach them once it went live. “I find this absolutely ridiculous,” said Ed. “The situation is such that, my next-door neighbour, whose property is located within 20 metres of my house, is able to order superfast broadband, and yet I am not. In fact 5 out of the 8 houses on my development are able to order superfast broadband and yet I am not. The cables connecting the rest of the village to the new roadside cabinet run past my house at the end of the drive, and yet my property (and others in the centre of the village), are not able to be connected to the newly installed fibre enabled cabinet. The confusion around Durno’s deployment is one that we’ve seen crop up a number of times before, most often on either new build developments or after a complex network rearrangement has taken place in order to tackle the dreaded Exchange Only Lines (this can result in an awkward mix of coverage). Using the example of new builds, one particular issue that we’ve covered before can occur when additional houses are built after Openreach has already planned to build the new network. This can be a particular problem when state aid supported roll-out schemes, such as the Digital Scotland project, are involved because the new properties may not have been factored-in during the government’s Open Market Review (OMR) phase (i.e. checking the area to see what plans exist for future / existing broadband networks). Obviously if the houses hadn’t been completed at the time when such things are being considered then it can result in some premises missing out on the new service (example here). At least this appears to be what Openreach themselves are suggesting has happened. “The fibre broadband rollout in Durno, Aberdeenshire, is part of the Digital Scotland Superfast Broadband intervention project led by the Scottish Government. A small number of premises in the Parkside Gardens area had not been built at the time the intervention area was set, and were therefore not included in the rollout. Despite this Ed finds Openreach’s explanation confusing, not least because some of the houses on the development are able to get fibre, and yet some are not. This is not proportioned in the order in which they were built. For example, numbers 4, 5, 6 and 8 were all allegedly the last to move in, and yet they can order it. Furthermore there have recently been two additional houses built in the village, which is on top of the first 8 house development, but interestingly Ed states that the last house to be built in the village is actually the first to report being connected to FTTC. Meanwhile some of the village’s much older properties are also unable to get the new service (going by Openreach’s checker), although it’s possible that this may be due to a different issue. Ordinarily new build home developers would take some of the responsibility for ensuring that the properties they construct can be adequately catered for via good broadband connectivity, although this can be much more challenging where smaller scale projects are concerned. The same relationships with network operators, as exists among the large mainstream firms, may not be in place. The good news is that Openreach has promised to have their planning team “review” the situation in order to “see what more can be done“, although at this stage it’s too early to know whether or not this will result in any of the overlooked premises being connected. Some additional civil engineering work may be required but at least the relevant properties are practically within touching distance of the cabinet, in one case almost literally. Meanwhile some other locals are still being told by ISPs that the new cabinet is full to capacity and thus cannot take any additional orders, which continues to confuse the picture for residents. Unfortunately issues like the example above are not uncommon. As communities grow then the broadband infrastructure doesn’t always adapt in harmony. It is all part of the superfarce, and replicated all over the country. They will all be classed as having it, funding will have been paid for it. The biggest con of the century. @chris. Could you at least make some attempt to get the facts right? No, those premises do not count towards funding or the BDUK numbers. Only premises which are capable of getting > 24mbps count, and that’s done on a premises by premises basis. Andrew, thank you for the information. The database actually reports two different connection routes, depending on if you use the address, or if you use the telephone number. 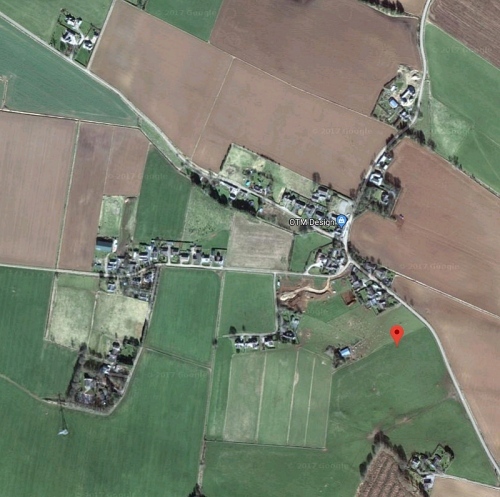 In the case of the address, as you correctly identified, some of the houses in the village, including mine, are shown as being connected to the fibre enabled cabinet in the village of Whiteford, 2.5 km down the road, near the exchange. That cabinet has been fibre enabled for 2 or so years, serving that village. However, using our telephone number, which I am led to believe is more accurate, we are still listed as being connected directly to the exchange. Either way, the issue is still the same. A new cabinet has been installed within 150 m of my house to serve the village, and we have not been connected to it, along with other houses. I have not as of yet, had a believable and consistent answer from Openreach as to why this eventuality happened. I have my guesses, but they so far have not been clear. Given the way the infrastructure in the village is routed, and there isn’t a capacity issue at the new cabinet (there have been a number of people in the village already informed that they cannot have fibre even though they are connected to the new cabinet), I am hopeful that we might be able to get routed to the new box, as our line follows the same routing as those connected to cabinet 2 from our house (See the diagram). When cabinets are installed they are delivered to serve a specific cable bundle, and for historical reasons some premises may not be part of those bundles and thus may not benefit. This can be resolved by rearranging the local copper network, but as this requires extra time and labour this is not done as standard in every village, hence 50/50 75/25 and other various splits are entirely possible. My assumption would be that when the USO comes in there would be quite a lot of houses in these anomalous positions that could be provisioned by copper network re-arrangements within whatever cost envelope is decided, especially if there is an element of aggregation. My suspicion would be that a lot of the mixed EO/cabinet provision has simply happened as when a phone line is ordered, the OR engineer has just used what is spare at the time. Exactly the same as what happened in our village, the houses that had the Cabinet at the end of their driveway were connected to the cabinet in another village 2km away. Another housing development built in 2004, had all but one of the lines connected to the correct cabinet, but one of them was marked as Exchange only. Openreach made some remark, that FTTC lines could only go one way, so houses could only be connected North/South of the cabinet. How did we get it sorted, after complaining to our MP for nearly 2 years, and still took them 4 months after they said they would fix it. JW, thank you very much for your comment. I have written to both our MSP (as we are in Aberdeenshire) and our MP regarding this matter, and complaints are in the process of being made, and an investigation is underway by Openreach. When we moved into the property a few years ago, I ended featuring on BBC Watchdog on BBC One, in a piece about Openreach, because at that time (2014), it took them 7 months to get us a telephone line, never mind about a fibre line. It wasn’t until the BBC publicly shamed them, that they mobilised significant resources and got the job done. 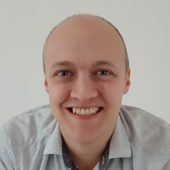 At that time we were told by the network engineer that the Pitcaple exchange was “in a complete mess” and that “the routing database is completely out of sync with the actual connections”. So, when they came to roll out fibre in our area, I am extremely disappointed, but not at all surprised, with the issues that we are having. I think it’s high time the government pushed forward further with their inspection of Openreach and have Ofcom not only demand that it is separated from BT completely, but also broken up. It is high time that rural area digital infrastructure is part nationalised where it is not financially viable, and that Openreach’s monopoly elsewhere is challenged with significantly more market competition. Although it’s a slow process, the government would appear to be beginning to hold Openreach to task, and have not simply given them the Ultra Fast Fibre roll out contract. However, at this current time, I am at a loss of what to do, since I have written to official authorities, I have written to media outlets and consumer affairs programs as well and Mark Jackson very kindly wrote this article to highlight our issues. The local route database is likely such a mess due to Open Reach having to allow third parties in to fiddle with stuff and they then haven’t updated the information correctly. Braking up OR or nationalising it won’t fix the issues you’ve had. This situation is by no means unique. Here in Rousdon, East Devon, there are several properties, relatively close to a fibred cabinet, with spare capacity, that are connected to a cabinet 6.5 km. After agreeing to connecting us to the cabinet close by Openreach then refused to do it, The result is one neighbour has less than 1 mbps and the other 30mbps. Having a high speed internet connection is becoming important enough to impact your standard of living and earning potential. We should create a forum where we can bring together all of the villages throughout the UK who are still being left behind this connectivity drive, and make it clear that the 2 or 5% that will be missing out, are not simply located on the top of Bein Nevis, but are in semi-rural and sometimes even town settings, within 10’s of metres of infrastructure. In fairness Rousdon is pretty scattered and given its relative position to nearby towns and road routing perhaps not surprising it is what it is. I am sure there are lots of examples of similar situations in other Aberdeenshire villages and elsewhere. The root of the problem here for me is the lack of visibility of the long term plan and poor communication. Digital Scotland are terrible at both but not the only problem. What really irks people is the feeling you’ve been missed/left out and will endure many more years to come of poor broadband while the other 95% enjoy their current superfast speeds and some of those that already have superfast access get ready to enjoy the next wave of technology to roll out and get even faster. If people actually knew why they had not yet been connected and knew there was a plan to help them in future, then I think you’d find most of them to be far more patient. If they cant wait for the plan to be executed, they can then explore the alternatives themselves but being continually kept in the dark and on the edge of perception that fibre is coming soon makes it very hard to gather support within a community to help themselves. @craski, very eloquently written answer. I agree with your sentiment entirely. Up until point, yes it has been frustrating waiting for it, but everyone in the village is in more or less the same boat. To then have it brought to the village, but not to everyone, with some people quite literally surrounded by houses that can have it, and they can’t, is just downright cruel. I’m sure in years to come, and it is becoming a neccessity to live, internet will be viewed like water, or power, or sanitation. Without it, you are living a much disadvantaged life compared those around. With regards to our village, there was quite literally no warning with regards to the planning. Quite simply people started to notice a new cabinet going in, and then telegraph poles being put up. It wasn’t until a few of use enquired to BT that it was confirmed that the fibre installation was going ahead. Certainly OR are their own worst enemy at times. When they brought fibre to my village they came to the village hall and gave a briefing – which was a very good idea – *but* having told us all about Cabs 1 3 4 5 we asked the obvious question about 2 to which they replied they didn’t have any information and offered no more. They ought to have preempted that obvious Q and at least had, if not an answer, then a timeframe in which they could give an answer. Cruel implies intent and as frustrating as I know it can be (I to am in the final 5% without superfast), I don’t believe BT, Openreach or Digital Scotland intended to be cruel. The network design isnt always logical as it has been added to and patched over the years and sporadic housing development makes it very difficult to plan and invest in the network. I do hope you get it sorted though but in the meantime, depending on the relationship with your neighbours, you may be able to get a neighbour who can order it to host you a connection and set up a fixed wireless access point or similar. Thats what we did and it works great. It looks like the same problem with properties in my area too on some EO lines. Openreach, have a rule which may I guess be imposed by OFCOM, that if the lines were arranged in a way which would increase the line length by 500m the would be noticeable speed drop on ADSL, this would be seen to be ‘unfair to those that do not want to upgrade to FTTC’. And so Openreach do not do it. Making noise in the press helps, but your solution should be to start a Community Fibre Partnership, until the rules about support for ADSL is dropped, you will be looking at needing to have 1 or 2 new poles and DP’s added, expect Openreach to charge you somewhere in the £5k to £10K range. Combe Raleigh tried BT’s Community Fibre Partnership scheme until Openreach said the village would need to pay Openreach £50,000. They will now get a Gigaclear full fibre solution without having to put a penny up front. BT’s Community Fibre Partnership is nothing more that a BT profit making machine designed to extract as much money as possible from rural residents that BT consider do not generate enough revenue to meet their profit targets. Stay well away from BT’s Community Fibre “Partnership” machine. Graham, thanks for your comments. Any idea how we might get Gigaclear or a similar company interested in providing alternative infrastructure up here in Aberdeenshire? I struggle to see how they could do it cost effectively without local grants, or charging significantly elevated prices for the connection once it is installed. Is that what has happened in Combe Raleigh? Is it part of a government funding initiative? I would love it if we could convince it to be trialled up here. To be honest, we are not really deepest, darkest Aberdeenshire anyway, we live approximately 5 miles from the local areas major town, Inverurie. It’s not like we are living on Bein Nevis! The Gigaclear prices near me are normal though the work is CDS funded. I don’t think they work outside parts of England but surely there much b a niche for a Scottish equivalent. I know some villages effectively did all the work themselves – digging, laying & granting free wayleaves etc)(as part of DIY fibre schemes) which can make the numbers work out. People down here raised the need for FTTP broadband in the press and at council meeting and kept telling Gigaclear we need them…. eventually they came. I would recommend you do the same and contact Matthew and Joe Frost, Gigaclear Business Development Director. The smaller altnets like Gigaclear, Hyperoptic and City Fibre have a completely different business model to BT and it is clear long term investors are prepared to back them. Good luck. A veritable goldmine of information, thank you so much! Openreach – ‘utter shambles’- sums it up perfectly. I currently have two outstanding cases open with them (one enquiry, one complaint), one of them since mid October, other than holding emails I have had no response whatsoever to either. Only hopelessly slow (1-2 Mbps) ADSL available here, no FTTC and can’t order FTTPoD at any price. I asked Gigaclear on a few occasions about the possibility of them building a fibre network in Aberdeenshire, (Netherley, Stonehaven) but they never answered me. They would talk to me to determine if I was a business in the city but they lost interest and stopped answering me when I inquired about rural broadband. Yes, that was my experience with contacting Gigaclear and all the other FTTP suppliers, that was for a location with +200 properties which are too far for FTTC to get better than 3Mb speeds, none of my calls were returned. Which is why I said Ed should start a Community Fibre Partnership, it looks like there are about 10 EO lines which need to be fixed, so that is about £500 per property and I would push to get FTTP not FTTC if I were running that CFP. Apologies, I meant to say City Fibre not Gigaclear. Aren’t cityfibre pushing into Aberdeen ? And why does every man and their dog think splitting OR from BT would help? Or are they just toys out of the pram comments? Maybe it would become worse? Maybe it should be nationalised , what do you think the tories would do for you Ed? What do they do for anyone north of Birmingham ? Why does everyone let OFCOM off the hook ? Isn’t it them that got us into this mess? Yes they have been digging up streets all over the city over the last couple of years. Also, places like Dyce & Bridge of Don have also been done.They must have a pretty extensive network by now. But at this point in time it is only for business use. Similar situation in london zone 2. New cabinet installed for exchange only connections, order opened up for my house but they just keep of failing install it since 2017 june as the line is not in the cabinet. No resolution timeline yet….. This is a completely normal situation, I have personally seen it numerous times. It is most often the case that properties on the edge of a village are fed from another village or that one culdesac that has a 20 pair EO feed for no apparent reason. Openreach sometimes take it into consideration if there are enough properties to make the rearrangement cost effective, so if there are 15 you are likely to get a fix, 4 or 5, unlikely. In this circumstance, if Openreach do not do anything I would suggest having a chat to your neighbours to see if together you would be willing to pay what will be a relatively small amount to get FTTP installed (as the cabinet and therefore proposed splitter is very near). You can do this as either a CFP or as individuals ordering a fibre on demand product, the new pricing is much more sensible for this. BT, Zen, AAISP ect will typically offer 40/10 and 80/20 packages at the same rental cost as FTTC and larger 160/330 packages too if you feel the need. It is’nt a given that the splitter is near a cabinet. It could be much further away. I can see some logic in that. Can you imagine the backlash if BT purposely made People’s ADSL slower. It wouldn’t matter if they made VDSL available or not, it would be an argument they could never win and Sky, Talk Talk etc would be jumping on the bandwagon moaning about it too no doubt.